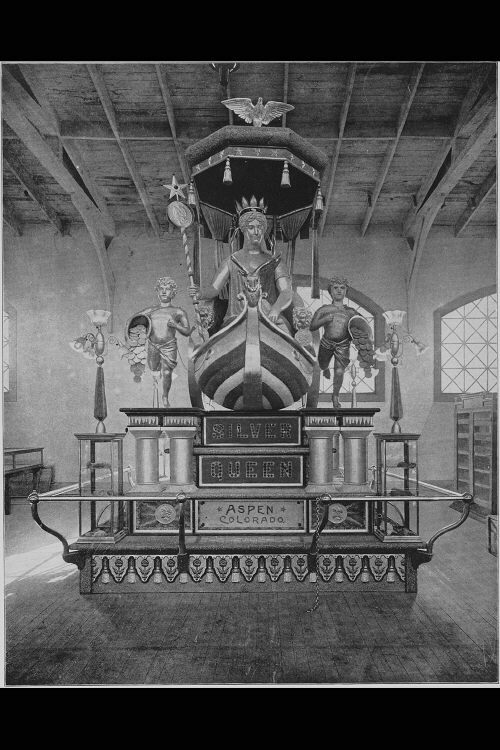 THE SILVER QUEEN - In the western gallery of the Mines and Mining Building - probably the most conspicuous object in that locality - was the golden and silvern group of statuary called the Silver Queen, representing a mining company at Aspen, Colorado. The engraving gives the details of this work with much fidelity, and shows the methods of its construction. The platform was artistically wrought, and protected by a metal bar. The electroliers rose from four square corners out of glass cabinets of Silver Queen ore. Convex show-cases lay along the other sides of the platform, and supported another and smaller platform. From this rose pedestals on which infantile figures in solid silver poured cornucopias of silver dollars out on the world, and held the lines of a boat with chariot wheels, in which, under a canopy, with staff of office in hand, sat the Silver Queen, with crown of gold. The canopy was richly made, and on its summit rested an eagle with wings displayed. This very costly adornment of the gallery outshone its surroundings. It was, at least, as beautiful as the Montana Statue, but the Exposition proved that white marble is the best material for the sculptor's art. Whether butter or gold, the "phenomenal" statue is lacking in interest.